This testing machine is specially designed for mobile use. The function is on tensile and compressive strength and the documentation of results. The testing machine is available in different versions of 0.5, 1 and KN. 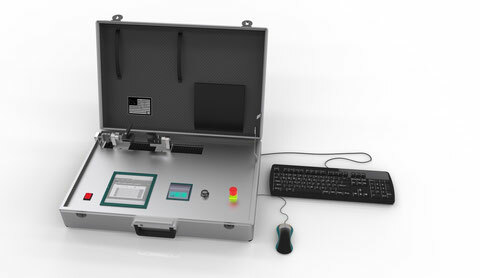 The universal testing machine allows test speeds from 0.5 to 600 mm / min. The speed of the testing machine is independant of the load. The type of control can be set to either position or force. The testing machine is available with <0.2% accuracy (calibration) or after class 0.5 to ISO 376 / DKD DKD-R 3-3. A cut-off frequency / sampling rate of 1 kHz shall forward the detection max. occurring peaks. Analogue and digital input and output are available. The mobile tensile testing machine is available with a mini thermal printer. It is also possible to connect a USB storage device. Delivery of the universal is inclusive software. The software detects the values of the force and displacement sensor, as well as the digital and analog inputs. After completion of the investigation, the raw data and the calculated results are displayed and stored. The input of product-specific data (manufacturer, batch, composition, inquisitorial, etc.) and data for testing (examiner, date, location, etc.) enables a documented and traceable investigation. The functional structure of the software allows for easy operation.